Forget Valentine's Day. 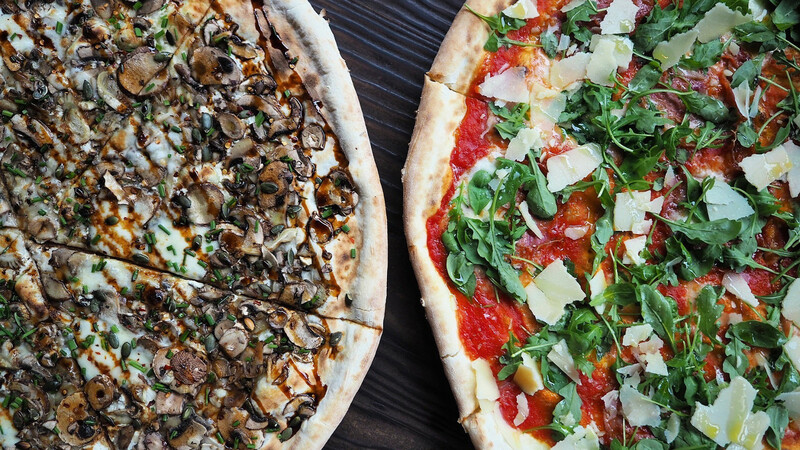 We all know that the most romantic day in February is the 9th: National Pizza Day. Pizza is love. Pizza is life. And it would be a grave understatement to say that we here at Foodism are big pizza lovers. It doesn't matter whether it's 4 in the afternoon, or 4 in the morning, there's never a time of day where a fresh pizza isn't a welcome sight at Foodism HQ. 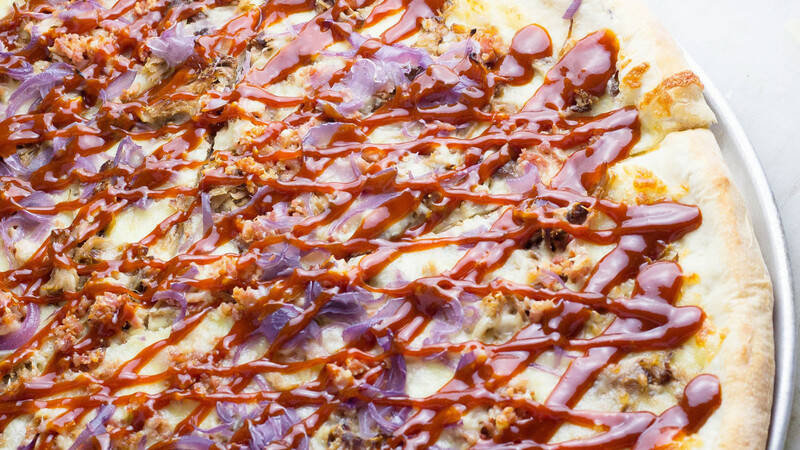 There aren't many other types of food that can deliver the kind of melted cheese-induced ecstasy that follows biting into a slice so hot it kindles the skin off the roof of your mouth. While we can agree that there's no better way to consummate one's passionate relationship with pizza than with a big old box of 'za on a Saturday night, as much as we're ashamed to admit it, sometimes a whole pizza can be a little bit too much to handle. An entire pie at lunch time is a one-way ticket to a tummy ache. 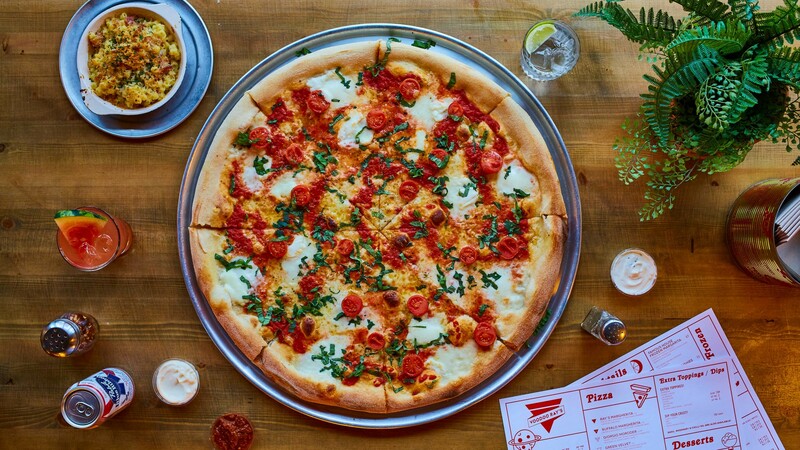 The more sensible (and cost-efficient) option for a midday hit of San Marzano is, as hangry Brooklynites have known for decades, to purchase your pizza by the slice, instead. The Big Smoke might not exactly be the Big Apple, but there are still an array of outlets slinging out handsomely large slices for that ideal grab-and-go experience. 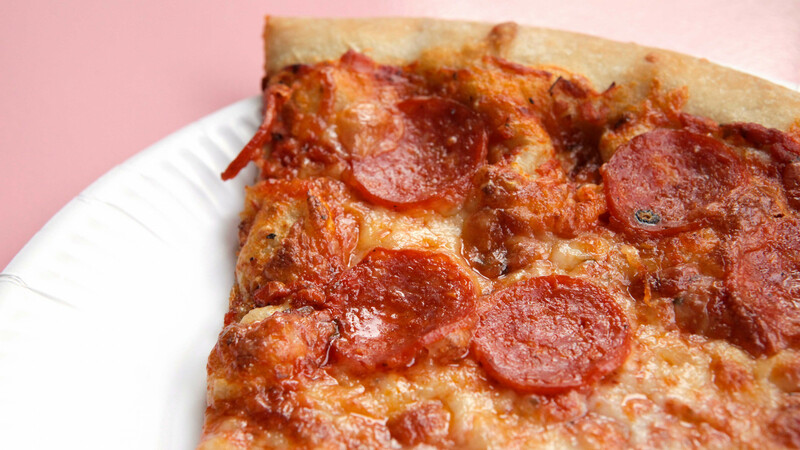 So, channel your inner New Yorker and pick up a slice at any of the following venues for the perfect pepperoni pick-me-up. Bon Appetit, baby. Bring a napkin and eat responsibly. 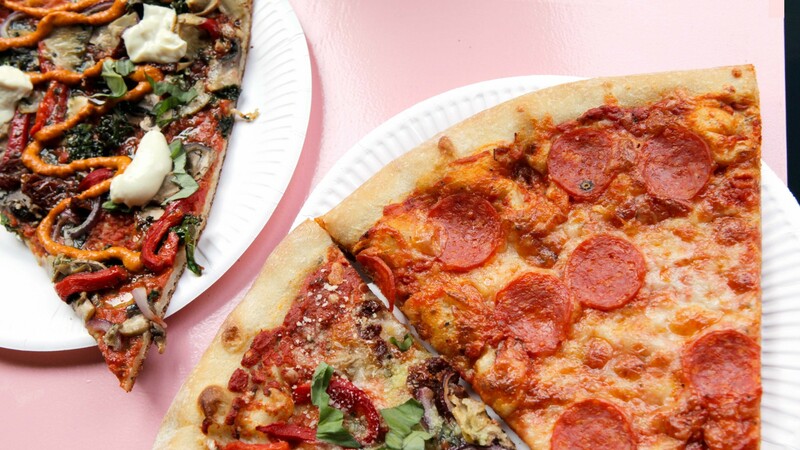 Voodoo Ray's specialises in slinging out generous slices of its 22" New York-style pizzas at its Dalston, Peckham, and Boxpark premises. The real difference maker to Voodoo Ray's post and pre-drink food of the Gods is the provenance of the ingredients. Voodoo Ray's imports San Marzano tomatoes for its sauce, Caputo flour for its bases, and creamy buffalo and fior di latte mozzarellas for its cheese. Simply put: they care. And considering that two of their whopping slices are equivalent to a whole 11" pizza while being only a fraction of the price, so should you, too. Inclusion is also something else that's on the menu at Ray's. The plant-based Queen Vegan slice (artichoke hearts, green olives, red onion, sun-blush tomatoes, tomato sauce, and green sauce) means that no-one is left out of the action. All the options are equally difficult to resist thanks to Joe Public's leopard-spotted sourdough bases. 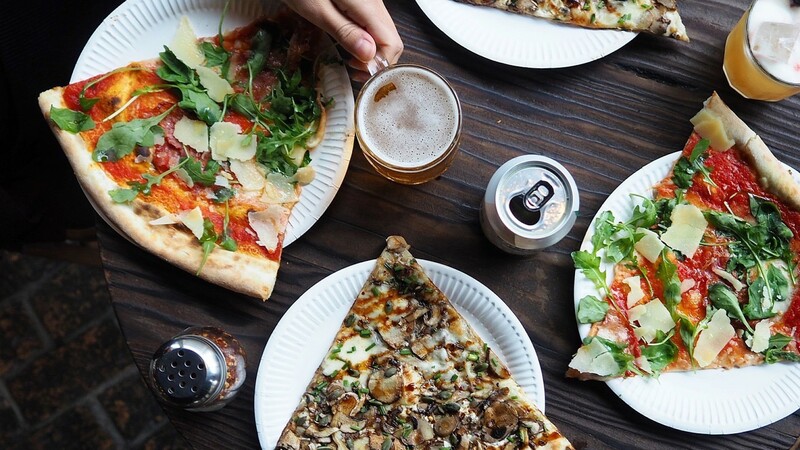 Located next to Clapham Common underground, Joe Public is perfect for anyone looking to lessen the overwhelming terribleness of their lengthy commute home with a crisp wedge of Californian-style pizza. 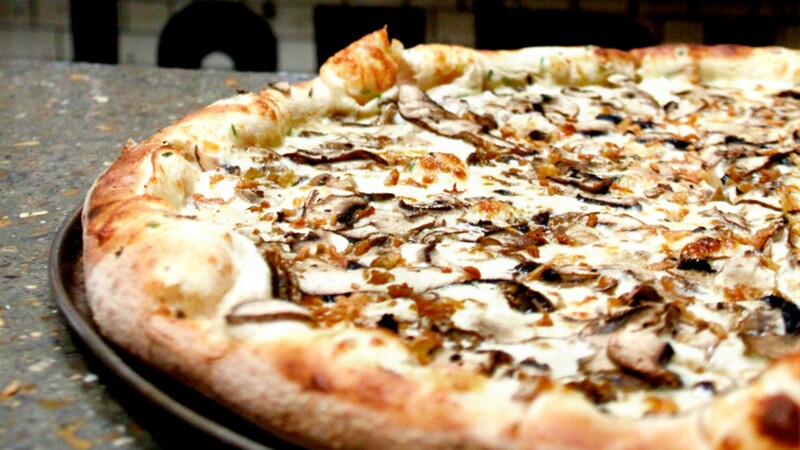 It's perfect for whether you're in the mood for a simple pepperoni or more recherché options like native mushrooms, crispy shallots, truffle oil, and parmesan on top of a cream chive base. In fact, all the options are equally difficult to resist thanks to Joe Public's leopard-spotted sourdough bases. That being said, gluten free pizzas are also knocking about the premises for the coeliacs among us. 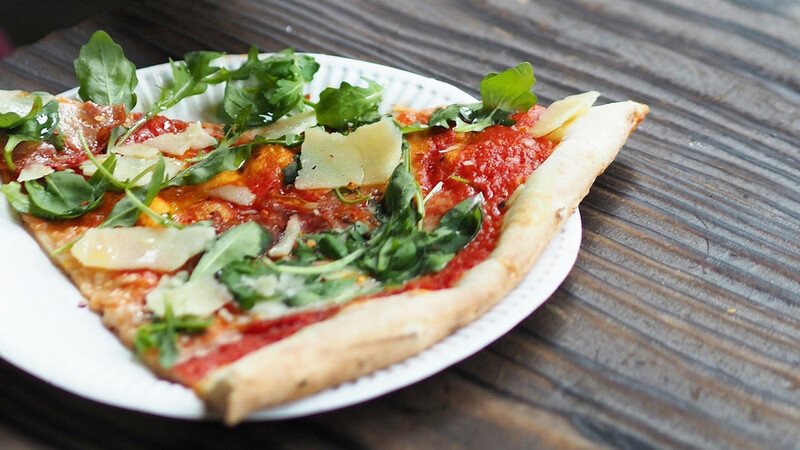 Prices start at £3.50 for a basic margherita slice with the price going up to a fiver for the more out-there offerings. 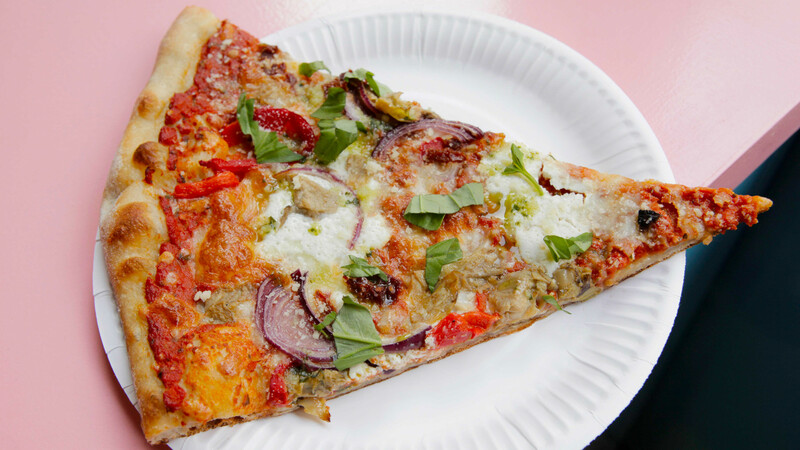 Joe Public's signature slice n' soda offer (which runs between 12pm-3pm) nets you a lunch-time slice plus a can of pop for just £5. Arancina pizza served "al taglio"
New York isn't the only city in the world that specialises in pizza by-the-slice. Far from it, in fact. Hefty focaccia-like slices of the stuff have been bought and sold "al taglio" in large rectangular squares on the streets of Rome for as long as pizza has existed. 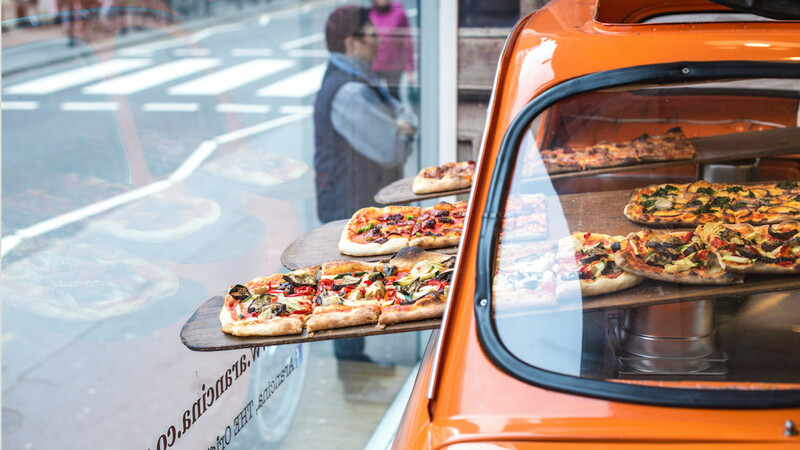 While these slices might not have the same flavour profile as their cheesier New York cousins, there's a definite appeal to eating pizza alla pala from Arancina's burnt orange Fiat Cinquecento. The pizza slices here – freshly made and divvied into manageable hunks – are cooked in electric ovens at a super high heat on top of a scorching stone base. 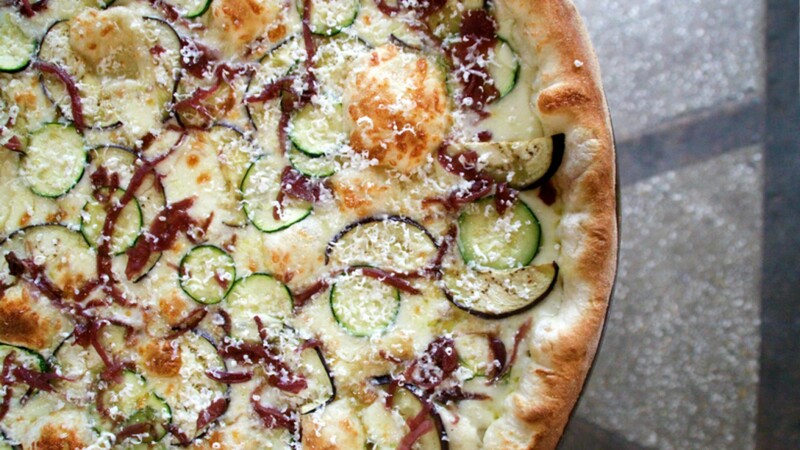 The result is a crisp pizza base with an addictively airy interior. So, do as the Romans do and give one of Arancina's London outposts a go. Simply part your way with £4.20, pick a slice of your choice from the rosticceria counter, close your eyes, bite down, and you'll be transported to the city Keats once called home. A truly Romantic experience. 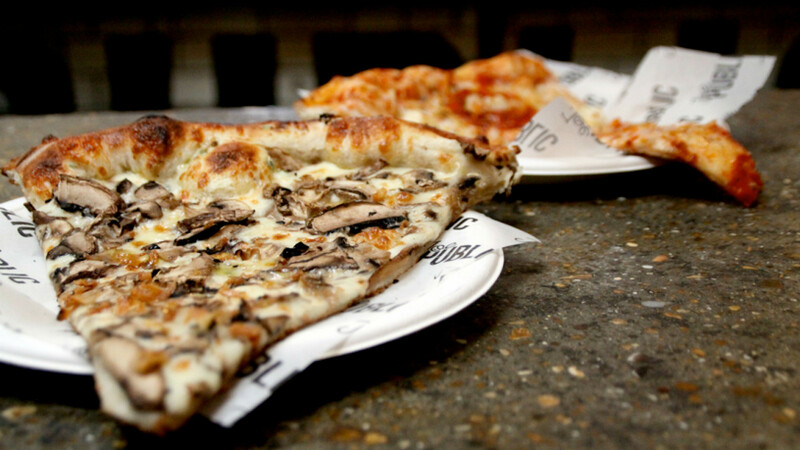 Paradise Slice is an independent start-up created by pizza-mad owners, Noura and Dan. 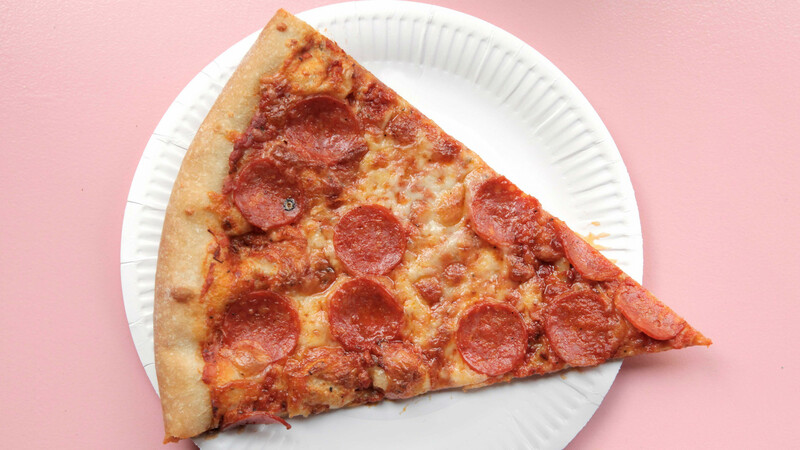 Noura, who spent 12 years living in New York, has transported her knowledge of the New York food scene to London, aiming to replicate that dollar slice ethos at Paradise Slice's Brick Lane premises. A plain cheese slice at Paradise is only £2.80. Hell, even the most expensive meat special can be in and around your mouth for £3.80. But the slices here aren't just affordable. The quality is top-notch, too. 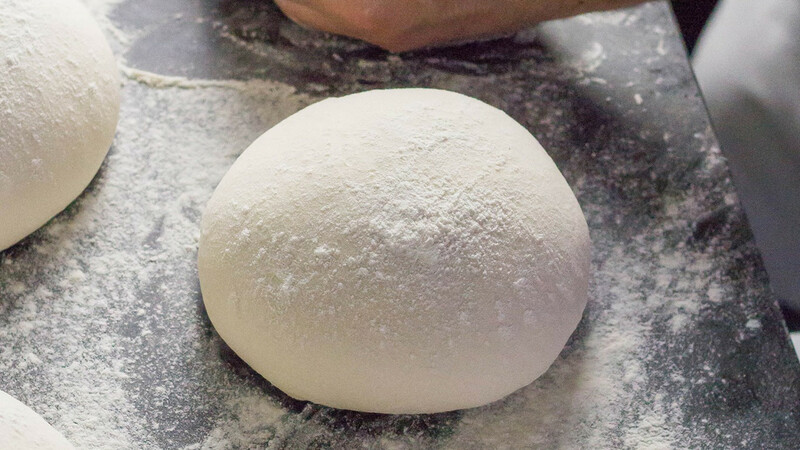 Paradise Slice uses a two-part fermentation method that means its dough receives a minimum of 70 hours proving before it's even come close to being ready for the oven. Tasty daily specials (Like a BBQ jackfruit vegan creation) also ensure you really need to go there on the reg to prevent suffering from the most heinous case of pizza FOMO. New York by name, New York by nature. NY Fold sells hand tossed, thin crust pizza slices that wouldn't look out of place in an episode of Teenage Mutant Ninja Turtles. 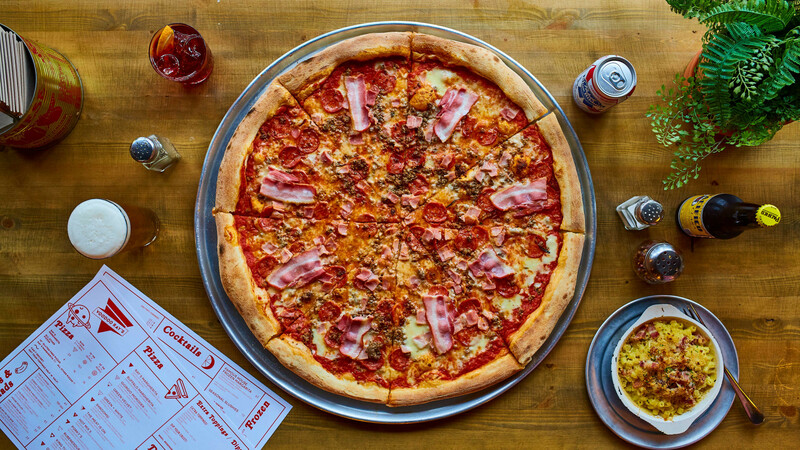 Inventively named slices like the 'Juliet', 'Butcher Shop', and the particularly patriotic 'Starry Hope' all populate the joint's lengthy menu. Speaking of the star-spangled banner, these slices all come 'Murica sized, too. A single slice from NY Fold measures 25cm x 25cm x 23cm. We didn't actually measure them, mind. That's just what it says on their site. 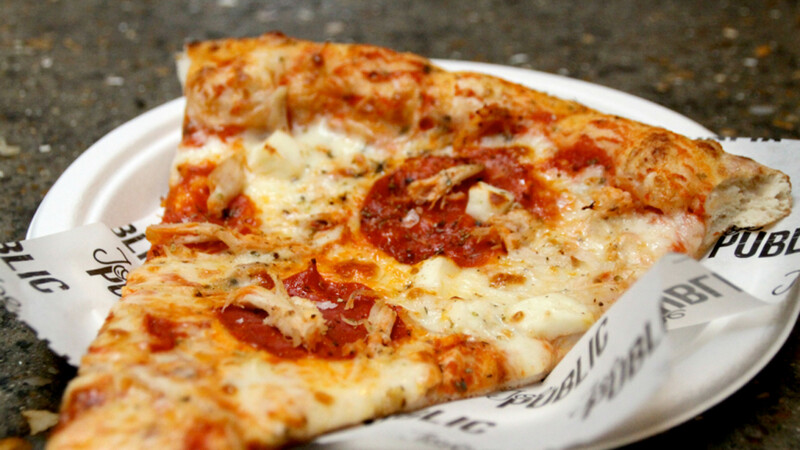 But, by all means, bring a ruler (and an appetite) when you make your pepperoni pilgrimage. It's £4 for one of NY Fold's regular cohort and £4.35 for the slightly fancier ones. God bless America. Malletti is a full-scale Italian trattoria in the belly of Clerkenwell. 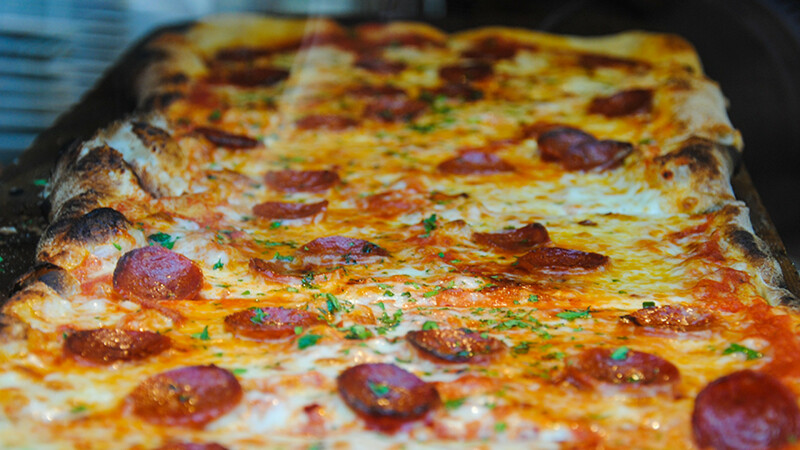 Square slices can be purchased at the joint's busy counter for £4 and rammed into your own belly in next-to-no time. As well as your regular cheese and tomato, you can also get your mitts on a 'Fiorentina' (spinach, egg and parmesan) or a 'Torta di Patata' (potato topped slice with ham, salami, and mozzarella). Bring that back to your cubicle and watch Pete from accounts go green with envy over his limp egg cress. It's an ideal, express experience that founder Antonio Verruto has additionally brought into the city's drab offices through Malletti's catering service. Which is a good thing to remember in case you ever want to treat Pete to a slice of the good life. 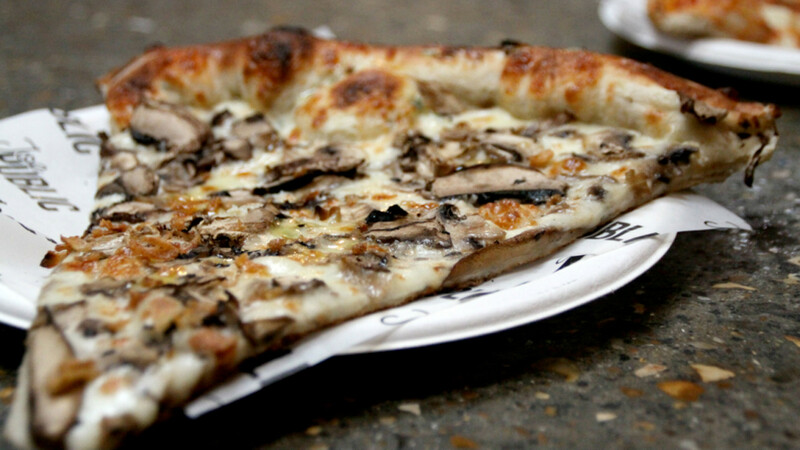 Perhaps the most prolific of London's by-the-slice outlets, Homeslice's six locations across the city prove its ever-growing popularity with everyone from ambitious bankers to the craft beer and industrial techno crowd. 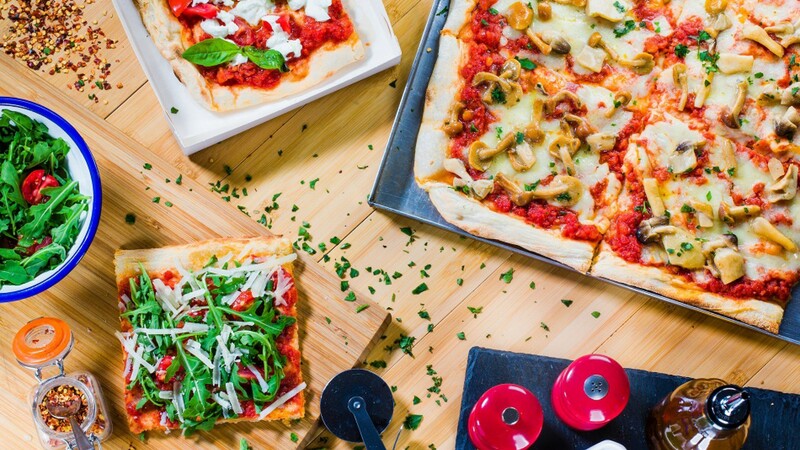 We can certainly vouch for the quality of Ry Jessup and Mark Wogan's beautiful mozzarella-mop-topped brainchild, having sampled our fair share of their giant wood-fired pizzas over the years. 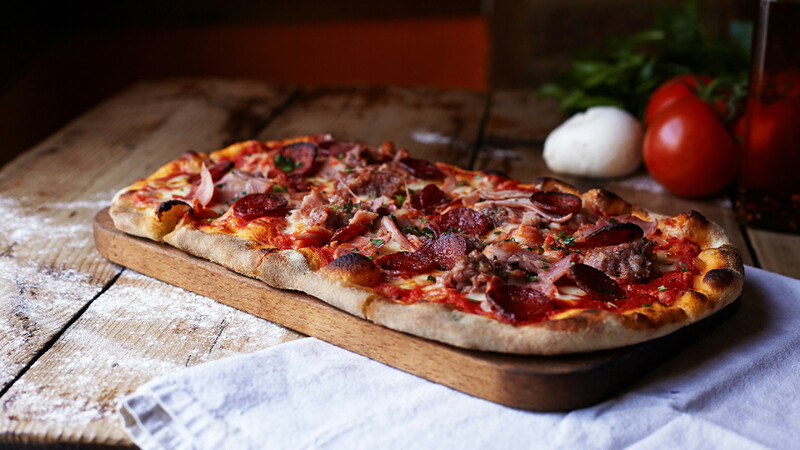 Order a 20" pizza to split between you and your homies or simply grab a £4 slice from a menu that includes the likes of ambitious spiced lamb, savoy cabbage, and sumac yoghurt-topped creations. 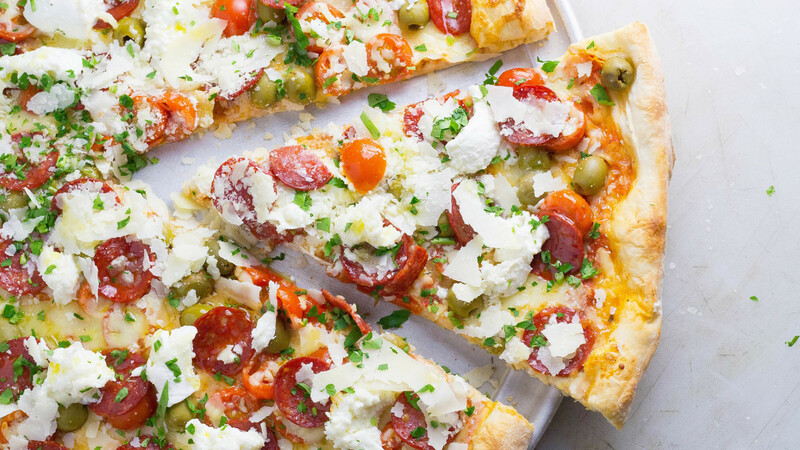 Pixxa's Roman square slices are perfectly designed for fast and easy on-the-go eating. Peckish before a job interview? 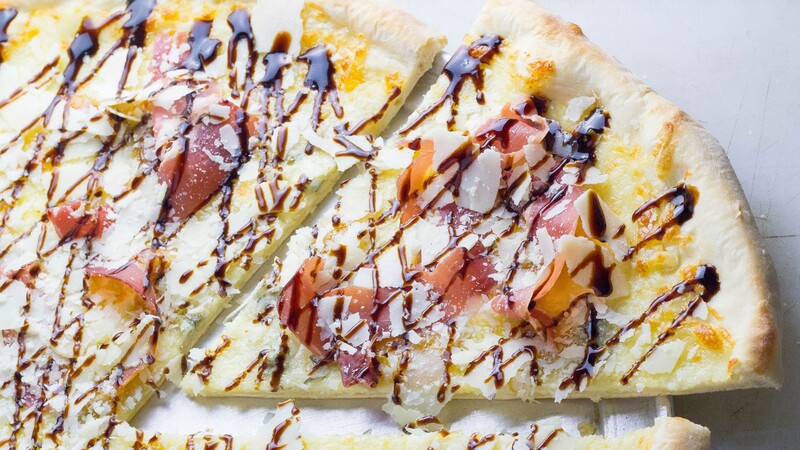 Get a slice of the potato and black truffle. In need of a pick-me-up after a tragic job interview? 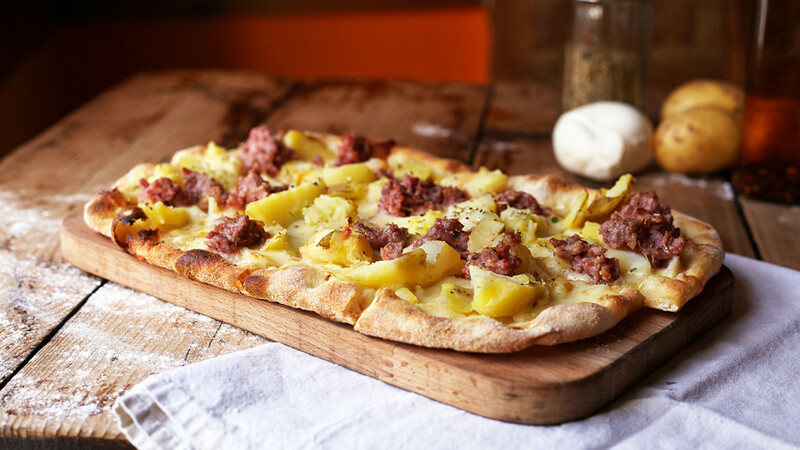 Get a slice of sausage and scamorza. 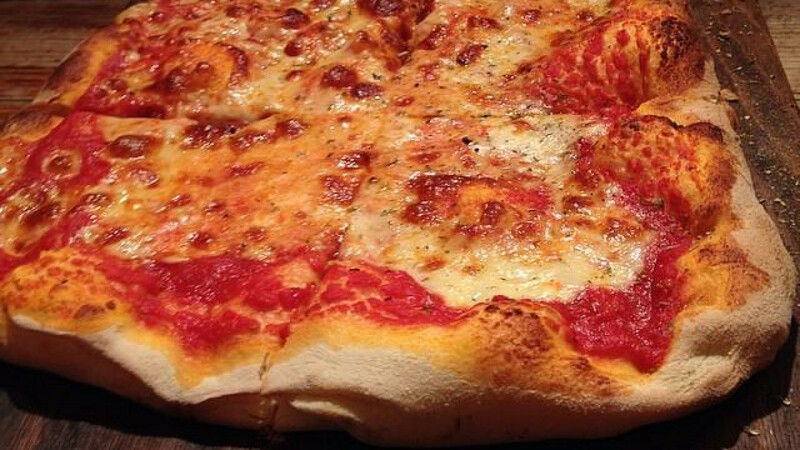 Anyone who sets out to prove that you can never be too busy for a slice of the good stuff gets our approval. And the people at Pixxa have also gotten a pretty resounding thumbs up from London's punters as well considering they've been in business for a decade. There's history in the crusts here, too. 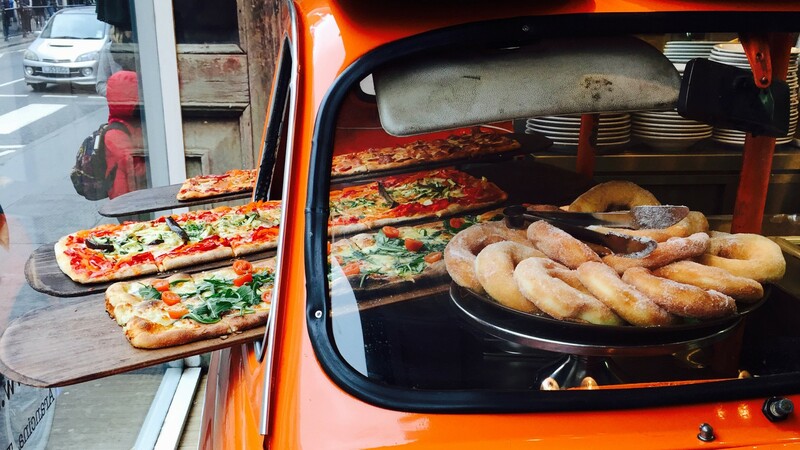 Pixxa's slices are exactly the sort of pizza you'll regularly see being consuming on Rome's cobbled streets – offering that self-same laidback eating experience inextricable from its city of origin. It's a classic. Think Audrey Hepburn in Roman Holiday levels of iconic. Or, for my fellow millennials out there: Hilary Duff in The Lizzie McGuire Movie.